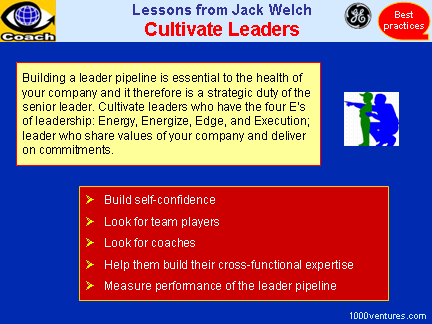 Building a leader pipeline is essential to the health of your company and it therefore is a strategic duty of the senior leader. My main job was developing talent. I was a gardener providing water and other nourishment to our top 750 people. When team members at Uniliver began to design a new leadership development initiative for top managers, they knew that the global company needed something to help it become a more enterprising and competitive industry leaders. Use the leadership competencies stipulated in the Leadership Effectiveness Survey (LES) to integrate a number of management practices with the purpose of building quality of leadership. Build self-confidence. "Your got to have the self-confidence to hire brilliant people, may times smarter than you are sometimes. You've got to feel very comfortable with that situation." Look for team players. You need new-type managers, those "who can swallow their ego, blur their identities, and work for the good of the company." Look for coaches. Coaching is an important part of the good leaders' role. Leaders must seek to develop high value in other leaders below them. Help them build their cross-functional expertise. Shift talents around, particularly at the higher level. Measure performance of the leader pipeline. Developing leader pipelines and keeping them tuned to produce leaders with the capabilities needed to succeed requires most senior leaders to develop a new mind-set, commitment, and a new repertoire of skills. Focus on metrics that show whether the leader pipeline is performing as desired. Track the number of leaders each leader has played a major role in developing. In your succession planning process, repeatedly ask the question: Who has the person developed, and how well are they doing it?